At the beginning of the year, we made a promise to fund 10 small business owners in developing nations through Kiva in celebration of the Inn on Mill Creek’s 10th birthday celebration. Kiva allows us to help a small business entrepreneur to lift himself or herself out of poverty by contributing to the success of his or her business. Once the business owner has repaid the loan, we get the money back and we can reinvest in helping someone else. One characteristic we like about Kiva is their map feature, which shows on a large scale how lenders from several countries impact one business owner across the globe. Last month, we and 112 other regular folks from all over the world contributed money toward a microloan to Babken Hovhannisyan in Armenia. Babken’s lenders and the lender location map can be found on Babken’s Kiva page. The map is on the right side, under the About the Country heading. Babken, 22, is studying at a teacher training college in Yerevan, Armenia. Additionally, he runs a bakery with his father out of their home. 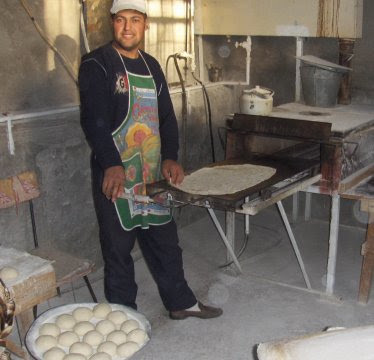 He wants to use his loan to buy wholesale flour in order to increase sales of the lavash (Armenian bread) that he makes so that he can pay for his studies. Babken’s story inspired us because he is a young and determined individual who, at 22 years old, has a good business mind and wants to improve his life through higher education. We wish Babken all the best! Check our Inn Turns 10! page to read about our other microloans and stay tuned as we share our final two loans for 2009.